we highly appreciate that you took your time to write a review of your recent stay with us. We are very happy that you enjoyed the comfort of our Garden Sleep System bed and our soundproof guest rooms. 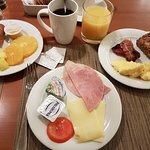 We will certainly forward your feedback regarding the quality of our guest service and the breakfast buffet to all our team member. Please let us know if we can be of any assistance with a future reservation. It would be our pleasure to welcome you soon again. 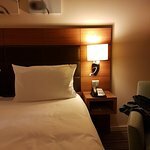 Le prix que vous avez trouvé est 17 % moins cher que le tarif moyen de 157 $US /nuit de cet hôtel. Nous avons dormi dans cet hôtel juste avant notre décollage. Excellent hôtel situé à l'intérieur de l'aéroport. Très propre et surtout très calme ! Très bon rapport qualité/prix, nous avons payé 59 € la nuit. Nous y retourneront sans hésiter. Thank you very much for your great review about your recent stay at the Hilton Garden Inn Frankfurt Airport. Thank you for rating us "the best"
We are delighted to read, that you had such a lovely stay with us and that you had time to enjoy our range of facilities. Again and again our guests comment on how quiet the guest rooms and really all areas of the hotel are. The construction is indeed fantastic. The airport is within walking distance, the train runs below the building and either side of THE SQUAIRE, the building we are located in, you have two major highways with heavy traffic. At the same time, all this infrastructure makes it so easy to get here, no matter which means of transport you prefer and wherever you come from. We definitely look forward to welcoming you again. Thank you very much for your kind comments regarding your recent stay at Hilton Garden Inn Frankfurt Airport. We are delighted to read, that our hotel offered you all, you wished for. The location of the hotel is indeed perfect for a stopover between flights. The design of the guest rooms is set up to meet the needs of the international traveller. A comfortable bed, safe, hairdryer, spacious desk and wardrobe and best of all, sockets to allow to connect US, EU and UK plugs, no need to search for an adaptor. 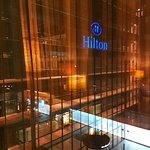 Once again we like to thank you for staying at the Hilton Garden Inn Frankfurt Airport and we hope to welcome you back in our property in the very near future again. Personnel de l'accueil aimable ... mais il faut parler allemand (on est en Allemagne, ne pas l'oublier ) ou en anglais. Les lits sont super confortables. Chambres un peu petites mais très fonctionnelles et design. Thank you very much for your kind feedback. It was a pleasure welcoming you at the Hilton Garden Inn Frankfurt Airport. Location is certainly an asset of our hotel. The train tracks just below the hotel and the airport only a 7 minute walk away. In addition the rooms are very quiet, thanks to excellent sound proofing. At the same time you can have breakfast and watch arriving planes through the window, you do not hear them. If you have a little extra time, it is also easy to reach the city of Frankfurt. Simply step on the local train, 5 stops and you are right in the middle of the city. Shopping is great or just enjoy a walk along the main river. We are very much looking forward to welcome you again. 320€ pour un garden inn même dans un aéroport c'est abuser. Franchement ça ne les vaut pas. Il était quasiment au même prix que son cousin le Hilton! There are so many reasons to stay with us, when passing through Frankfurt. The train station is right below the hotel, so easy to get here or to travel on to any major German city. The terminal building is only a short walk away. Cross the skywalk and you are there. No need to leave the building. The hotel offers a fitness center, open 24 hours a day, the sauna and steam room close at 10.30pm. Our restaurant is open for breakfast, quite a nice choice and please order your favorite egg dish directly with the service team.